Only a few cities and states so far have implemented laws requiring restaurants to post nutrition facts for their offerings. 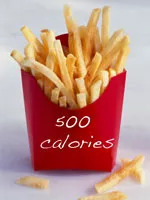 But now, legislation is making its way through Congress that will help implement a national law requiring all large U.S. chain restaurants (20 or more locations) to disclose at least calorie counts for all the foods and drinks on their menus. While the National Restaurant Federation has tried tirelessly to lobby against any type of labeling requirements for restaurateurs, this is one issue that just cannot continue to go unaddressed. There are so many issues—pro and con—about which I’ve been a part of many debates. The National Restaurant Association recently backed the Senate-proposed bill, and even dietitians can’t agree whether having nutrition facts on menus will help, hurt, or do nothing for our nation’s obesity problem. Personally, I’m of the belief that giving consumers more nutrition information helps guide their food choices. Many will chose to ignore the nutrition facts, but some will use it to make better decisions. Even kids these days seem to be making healthier choices when it comes to fast food, so I believe that the more info, the better. I’m hopeful that if Joe Six-Pack is ordering a Double-Whammy Burger and sees that it’s 1,500 calories, he may decide on the Single-Whammy Burger instead to cut out a few hundred calories from his lunch. “The American Dietetic Association is a strong advocate for policies that will improve the lives of Americans through food and nutrition strategies. There is no goal more important in the current debate over health reform than to have a lasting, positive impact on all Americans’ health. Nutrition is at the foundation of health—necessary to be healthy and effective in preventing delaying, offsetting, and managing disease. We support policies that facilitate good nutrition, including consumer-tested nutrition information and education and financial support for research. “We see the inclusion of restaurant menu labeling provisions in health reform appropriate to achieving that goal. People need scientifically valid and understandable nutrition information to make healthful choices in all venues, including restaurants. Providing good, accurate, and tested information to a consumer educated in nutrition basics can have a powerful effect on food selection at the point of sale. Over time, the act of millions of people making healthful choices can impact the health of the nation and improve the food supply by consumer demand. “A national approach will be helpful to consumers’ utilization and understanding of the information presented. Basic information on the menu or menu board would be complemented with more detailed information on fat, saturated fat, cholesterol, sodium, total carbohydrates, complex carbohydrates, sugars, dietary fiber, and protein being available upon request. Question for you: Would you use the nutrition information on menus when eating out? Why or why not? Previous: Most Common Types of Cancer in the U.S.